Rug up and get the whole family out of the house because Melbourne's pop-up ice rinks are ready for you! The "Skating At Festival" returns to Melbourne over the winter school holidays with ice skating experiences at two city locations: Southbank & St Kilda, and one down on the Mornington Peninsula: Sorrento. For the first time ever, you will be able to ice skate on the Crown Riverwalk along the Yarra Promenade, Southbank. If you head down to St Kilda, your family can skate on the corner of Acland Street and Barkly Street. At Sorrento, the festival's pop-up ice rink will return to the foreshore for the winter break. When: From June 22 – July 15, 2018. The pop-up undercover ice rink will return to Eastland over the winter period, with free sessions for all who spend $20 or more in any of Eastland's Town Square restaurants. When: 23 June - 26 August 2018. The Olympic Ice Skating Centre in Oakleigh South. You see? There's no reason to stay home this winter! 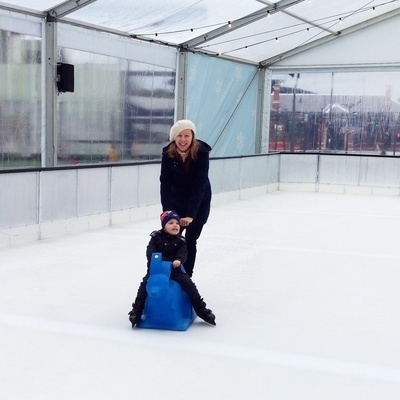 Get your skates on and embrace the cooler weather at one of Melbourne's many pop-up ice rinks.